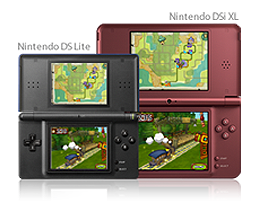 You'll experience portable gaming all grown up with the extra large screens of the Nintendo DSi XL system, 93% larger than those of the Nintendo DS Lite system. Enjoy a wider viewing angle, a larger pen-like stylus, and 3 pre-installed titles to enjoy right out of the box. Extra Large Dual Screens: The Nintendo DSi XL system has two ultra bright LCD screens for double the action, and exciting gameplay possibilities. At 4.2 inches, these screens are 93% larger than those of the Nintendo DS Lite system, and offer an easy way for friends and family to join in on the fun. Pre-Installed Software:The system comes packed with three software titles pre-installed. These include Brain Age™ Express: Math, Brain Age™ Express: Arts & Letters and Photo Clock. Also included is the Nintendo DSi™ Browser and the Flipnote Studio™ application. Sound: With the Nintendo DSi Sound application, you can record and play with your voice using the built-in microphone and a variety of fun filters, or play with your favorite AAC music files. A world of fun with sound awaits. Touch Screen Technology: Get pulled in with intuitive touch technology on the bottom screen. Use the included stylus to tap your way into an exciting new experience. Microphone:Located at the center of the unit, a built-in microphone allows your Nintendo DSi XL system to pick up spoken commands in select games. Full Size Stylus: This easy to hold stylus—included in addition to the traditional stylus housed within the system—makes touch control for your favorite games a whole lot easier. Camera: With the Nintendo DSi Camera application, use two built-in cameras and 10 interactive fun lenses to capture the world around you and make each photo your own. Multiplayer & Downloads: Using the local wireless network for your Nintendo DS System you can play your friends in the room--or connect through Nintendo Wi-Fi Connection and play others from across the globe**. You can also download demo versions of certain Nintendo DS games from DS Download Stations at select retailers, or via the Nintendo Channel on the Wii console. PictoChat: With PictoChat, you can create drawings and text messages with your stylus to send to friends who are within range and also have a Nintendo DS series system via local wireless connection. Draw, doodle, share ideas or do anything else you can think of on the Nintendo DS touch screen. We love all thing's Nintendo in our home! I can still remember playing the original Nintendo Game Console with my brother's when we were little. The kid's absolutely love to play Wii and I love that it gets us all up and active (all while allowing us to spend quality time together as a family). That being said, we were thrilled to have the opportunity to check out the Nintendo DSi XL! While B is the one who mainly play's it, I've snuck in a few hours of play on it as well (there are tons of fun games available for DSi XL that offer fun for adults too). While we didn't own the DS version, I do have a friend who's daughter loves her DS, so I was familiar with the original DS system and the size beforehand. The DSi XL offers dual screens that are 93 % larger than the Nintendo DS, making it so much easier to play (especially for mommy who can't see quite as well as she used to)! There is such a vast library of games available for the DSi XL (games for the DS systems are also compatible) making it non stop fun (it's also equipped with WiFi)! B has amassed several Disney games, and some wonderful games that offer learning opportunities as well. The Nintendo DSiXL offers the perfect portable gaming experience for all ages, and would make an amazing "WOW" Holiday Gift! I got your blog from MBC. Look forward to reading your blog! I liked it! Also NEW follower. I hope you'll check mine out and maybe follow!